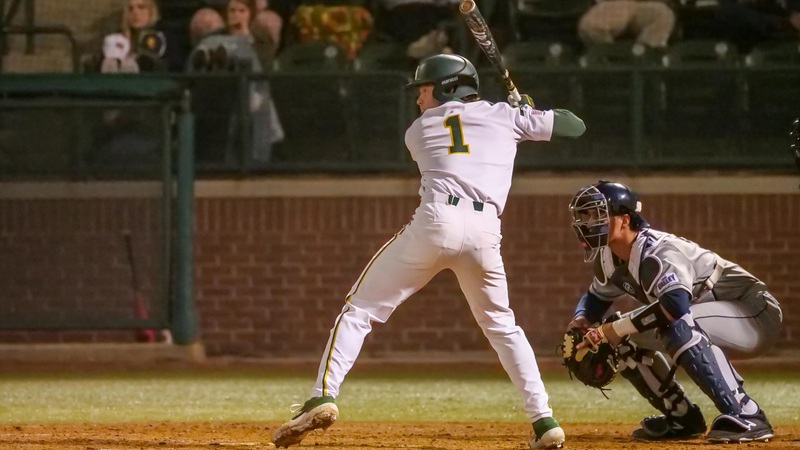 WACO, Texas – The Bears dropped game two of their nonconference series with Cal Poly, 3-1, on Saturday afternoon at Baylor Ballpark. Cole Haring led the Bears at the plate on the day, going 2-for-4, while Richard Cunningham, Davis Wendzel, Davion Downey and Andy Thomas each had one hit apiece on the day. The Bears (12-5) had opportunities down the stretch, but left eight on base and were unable to get the offense going. The Mustangs (7-10) got on the board first, plating a run on an RBI single with the bases loaded and two outs after Baylor starter Jimmy Winston got too quick outs but then had trouble locating, allowing a hit and back-to-back walks before the single made it 1-0, Mustangs. Winston settled right in though, coming back to get a fly out to end the inning, stranding the bases loaded. Winston settled in down the stretch, however, putting up zeros in his next three innings of work to keep the Bears down just one. The Bears answered in the bottom of the fifth inning, putting the pressure on the Mustang defense after a leadoff double by Haring. The Bears sent Haring, who stole third on what was ball four to Chase Wehsener, and then he came around to score as the throw from Mustang catcher Myles Emmerson tailed into left field. However, in the top of the sixth inning, the Mustangs answered back, plating two runs off reliever Jacob Ashkinos. After allowing back-to-back singles to start the inning, Ashkinos hit the next batter and that gave way to a new arm from the bullpen, Ryan Leckich. Nick DiCarlo singled to left for the Mustangs, bringing home the go-ahead run and an insurance run to make it 3-1, Cal Poly. Leckich settled in and got out of the inning without any further damage. The Bears had opportunities down the stretch, but were unable to get the offense going. Their best chance was in the bottom of the eighth inning. Wendzel laced a one-out single to center and then an 11-pitch at bat by Davion Downey resulted in a single to left, giving the Bears runners on the corners with just one out. The Mustangs went to the bullpen for RHP Michael Clark to face Shea Langeliers. The junior swung first pitch and a ground out to short resulted in a 6-4-3 double play to end the inning. The play was reviewed by the umpires to see if Langeliers was safe at first, but the ruling of out was upheld and the inning was over. The Bears had another chance at a two-out rally in the ninth when Haring singled for his second hit of the day, but he was erased on a fielder’s choice at second to end the game. Relievers Leckich and Daniel Caruso each pitched two flawless innings to keep the Bears close in the final two frames. Ashkinos took the loss, his first decision of the season, falling to 0-1 on the year. Mustang starter Bobby Ay earned the win to improve to 1-0 on the year. Clark also earned his second save of the season. *Haring led the Bears with 2 hits on the day. He was the only Bear with multiple hits on the day. *Haring had the Bears’ only extra base hit on the day, a double which was his first of the year. *Davis Wendzel extended his current team-high hitting streak to seven games. *Wendzel has now hit safely in 16 of 17 games on the year. *The Bears have had at least one extra base hit in 16 of 17 games this year. *Winston made his first start of 2019 and threw 4.0 innings, allowing 1 run on 4 hits with 3 walks and no strikeouts. *Ashkinos took the loss, his first decision of the year, in his fifth appearance of the season. *Leckich threw 2.0 innings of one-hit baseball, with 1 strikeout in his team-leading ninth appearance of the season. *Caruso threw 2.0 scoreless innings, allowing just 1 hit with 1 strikeout in his seventh appearance of the year. *Winston and Leckich are tied for the team-lead with nine appearances on the year. *Langeliers saw his reached-base streak of 19 game snapped. 2 – The number of hits Cole Haring had in his second game back since March 1. He scored the only run for the Bears on the day with a stolen base and then came home on a throwing error by the catcher. The rubber match of the series vs. Cal Poly is set for Sunday, March 17 at 1:05 p.m. It is Boys and Girls Club Day at Baylor Ballpark, and fans that bring a new or gently used soccer ball, volleyball, kick ball or receive a discounted $3 ticket. The game will be televised live on Fox Sports Southwest.